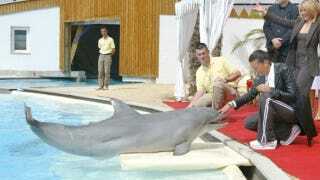 It was originally believed that the techno music pumping out from the club just yards from the dolphins' pool had caused their deaths. But toxicology tests carried out by the forensics institute in St Gallen show that the heroin substitute Buprenorphin was present in the dolphins' urine. "Opiates are extremely dangerous for underwater mammals, explained marine biologist Cornelis van Elk in an interview with The Sun. "The reason is that dolphins are conscious breathers, which means they actively decide when to come to the surface to breathe.Even when sleeping, there is part of the brain that automatically controls the breathing instinct in the same way as it does for people when asleep. "Drugging them with opiates causes this part of the brain to switch off, with fatal consequences." 1. Our dolphins did not die shortly after a rave party. They died 2 weeks after a party. So the party had nothing to do with it at all. This is an untrue story let out by animal activists which might be the cause of the death of our animals. 2. We did not rent out land, but our building Chateau, that had been built to host all kinds of events. For the last 10 years we had disco parties in this sound proofed building on every weekend. We are in the middle of a living community and if any noise would disturb anyone, the neighbours would have been the first to shut it down. Even though some animal activists did state that it would harm the animals (after over 10 years) our state veterinarian and all kind of Media stayed in our dolphinarium during the night we hosted the disco party. Nothing was heard or disturbed the animals. 3. The death did not go on for hours [as has been reported elsewhere]. It was for a few minutes and shocking. 4. Any kind of Medication can only be given with food. That means, that the poison had to be put into the fish. We have found marks on our door locks that showed forced entry into the food preparation room. The two dolphins that have died in that short amount of time have been the only two males to secure our reproduction. This attack was a planned strike against us. 5. We have been working with dolphins for over 35 years and our animals always come first. After the death of the first dolphin, we knew that he died of an unnatural cause. According to Gasser, animal activists have been circulating untrue stories in an effort to make the park look bad. These statements align with those reported over on MSNBC.